Blu-ray discs have been embraced by entertainment lovers and technology geeks for a variety of reasons. The discs are resistent to scratches and fingerprints and hold more data than traditional DVDs. The Blu-ray format can hold up to 25 gigabytes (GB) of data on a single-layer disc and 50 GB on a dual-layer disc. Blu-ray’s increased storage capacity is more than five times what can be stored on a traditional DVD. LG Electronics’ BH08LS20 8x Blu-ray Super Multi Drive with LightScribe is an internal Blu-ray writer for computers. 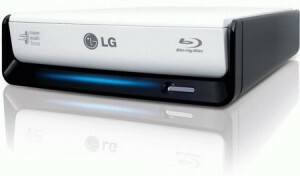 LG’s writer accepts double-layer Blu-ray discs and DVD +R/+RW. The Super Multi Drive features the world’s faster writing speed of 8x for Blu-ray. It can also record at 16x for DVDs and 40x for compact discs (CDs) and re-write at 2x for Blu-ray, 8x for DVDs and 24x for CDs. Erasing discs with the BH08LS20 takes just 18 seconds for a quick erase and a full erase can be performed in just under 3 ½ minutes. Playback speed is automatically controlled to reduce noise when playing media. It’s maximum reading speed is 6x for Blu-ray, 16x for DVDs and 40x for CDs. A serial advanced technology attachment or S-ATA is used by the BH08LS20 for an enhanced computing platform. The Blu-ray Drive uses LightScribe Disc Labeling. Developed by HP, LightScribe burns a durable, high-quality label directly onto special discs which have a thin dye coating on the label side. The LG BH08LS20 is accompanied by a disc containing PowerDVD, Power2Go, PowerProducer, LabelPrint, PowerBackup and MediaShow by CyberLink. Just as DVDs revolutionized optical data storage ten years ago, Blu-ray technology is doing it again. 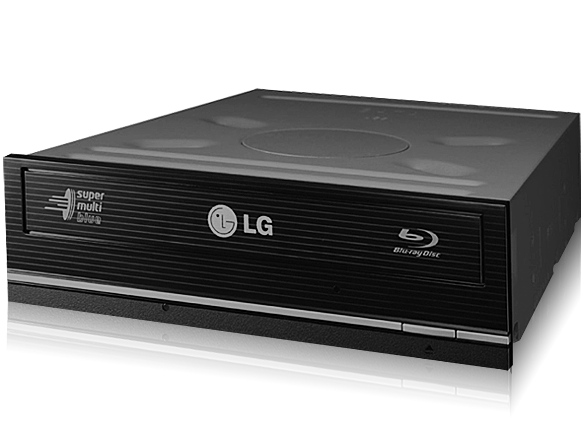 The first generation of Blu-ray recorder has quickly come to perfection in the LG BE08 LightScribe Blu-ray ReWriter. 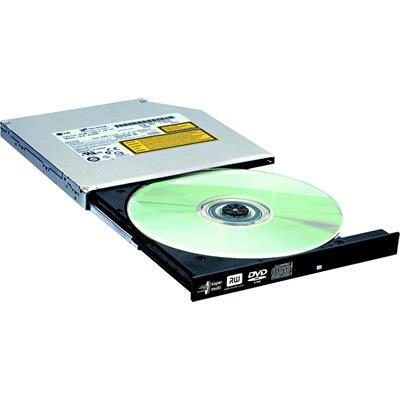 This external Blu-ray writer and player connects via either eSATA or USB 2.0 and is backward compatible to work with regular DVDs and CDs. Using the eSATA connection, data can be transferred to and from discs at speeds up to 1.5 Gbps. In addition, the LightScribe feature burns customized labels directly onto the top surface of specially prepared LightScribe discs. The LG BE08 operates on any version of Windows XP, Vista, or 7 and writes CDs at 48x speeds and DVDs at 16 x speeds using buffer underrun protection to ensure a smooth transfer. All hands-on tests have proved the LG BE08 to be a flawless Blu-ray recorder. Using the USB connection will prove to be a slower option with the high data capacity of the Blu-ray discs so the eSATA connection is highly recommended. Included in the box is an external eSATA bracket and cable that fits a standard desktop PC case so that if your motherboard has an open SATA socket, an external SATA outlet is instantly created with installation. The LG N2B1D is a network attached storage unit, with up to 2 terabytes of hard disk space, and a rewritable blu-ray drive for permanent backup storage. Unlike many NAS systems, it’s aimed at both businesses and regular consumers. The blu-ray recorder is one of the most standout features of the N2B1D. It lets you store up to 50 GB of data on a single disc for permanent archiving of important information. 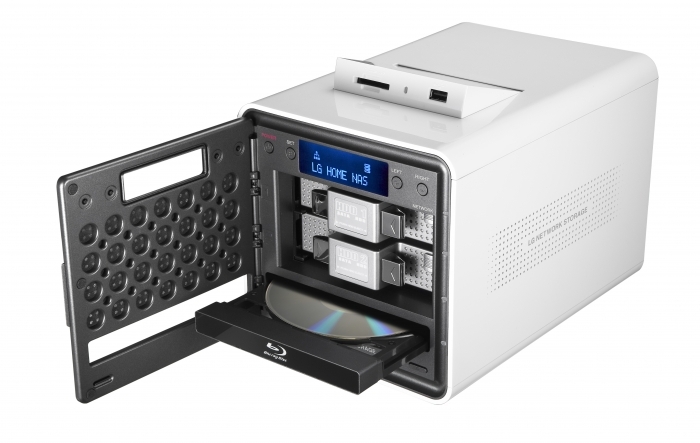 When you combine this with the huge amount of fixed storage contained in the N2B1D, you have a truly robust solution that’s both easy to use, and reliable. It’s perfect for storing everything from your family photo album, to huge customer databases, or massive document collections. Having access to a machine on your home or office network that’s strictly devoted to storing data is incredibly convenient, and once you try it, you’ll wonder how you ever got by without it. As an added bonus, the N2B1D doesn’t use very much power compared to other machines in its category, and it’s surprisingly quiet running, which can sometimes be a problems with devices containing so much storage and multiple disks. Every year, computer data gets more complex and takes up more space. The need for a reliable storage solution is becoming more pressing for people in all walks of life. With a functional blue-ray writer, and plenty of storage space on board, the LG N2B1D could be a great addition to your home or office network. 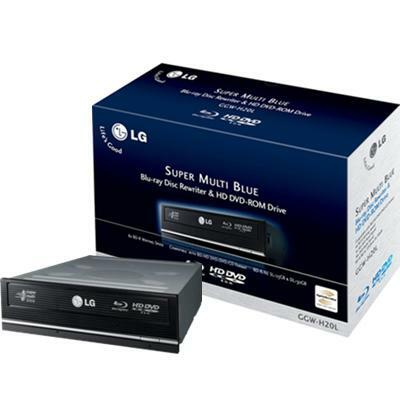 This competitively priced LG GGW-H20L can read both Hi-Def formats, Blu-Ray and HD-DVD whilst also providing the ability to write Blu-Ray discs. 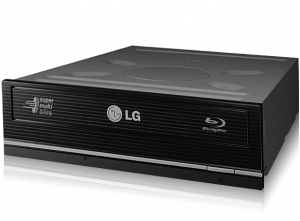 If you put your eggs into the HD-DVD basket during the format wars then LG provides the perfect solution at a price point that makes it a very attractive offering. At sub £150 the LG GGW-H20L delivers a perfect balance between performance and functionality, think of it as the Ford Mondeo of Blu-Ray writers! The GGW-H20L is the update from the quad speed GGW-H10N and raises the speed of the Blu-Ray disc writing to 6 speed. 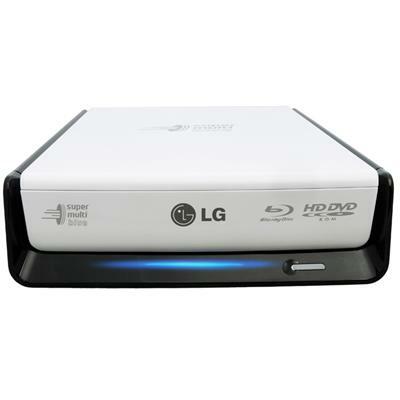 If you are looking at adding a Blu-Ray writer to your portable computer then look no further than the LG GBW-T10N. This 4x Slim Super Multi Blue for notebooks delivers an outstanding package for the mobile user. 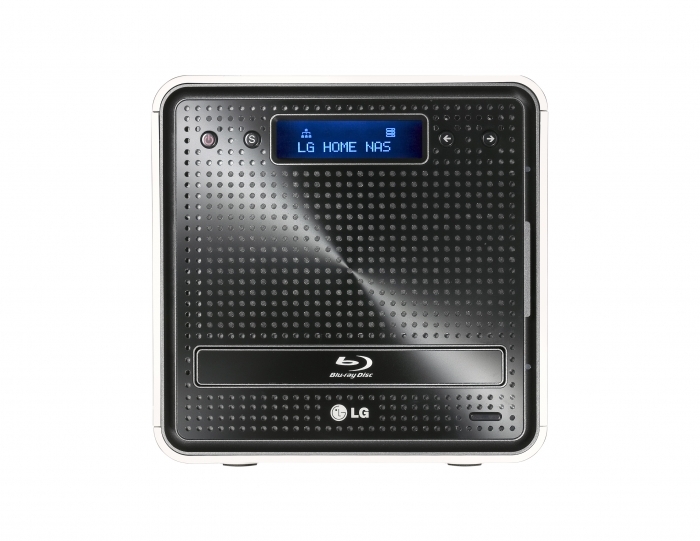 The LG GBW-T10N is able to read and write to all of the common disc formats such as DVD, CD and more importantly Blu-Ray. Hook the LG BE06 to your PC or MAC by simply by connecting it up to a standard USB 2.0 port. Nobody could argue that this offering from LG is an ugly duckling. The sleek and stylish unit operates either vertically or horizontally and comes in an ultra shiney white gloss enclosure featuring a rather nifty touch sensitive eject button. The fact that this is an external model means that even the novice consumer can purchase and install this drive in a matter of minutes. The majority of blu-ray writers on the market today are for internal installation into a PC so a working understanding of the inside of a PC was required. Along with the USB connection the LG BEo6 also requires the connection of it’s power supply so this isn’t the holy grail for the portable worker but at least you can take this drive away with your laptop and enjoy high definition blu-ray movies. If you where an adopter of the now defunct HD DVD format then you’ll be pleased to hear that the drive is at least able to read your HD DVD’s so that you aren’t forced to sell them for a miniscule amount whilst you then search out the blu-ray version. As one would expect the BE06 can handle the play back and writing to DVD and CD’s even if it’s not at todays cutting edge speeds. LightSribe is include to allow for the printing of images and texts onto supported DVDs but the fact that it takes over 20 minutes to print these images may make this feature less appealing. The LG BE06 features a very respectable 6 speed writing capability but with 4 speed BD-R still being fairly rare it will take a few months before media is available to make the most of these write speeds in either 25GB single layer or 50GB dual layer formats. Copyright © 2009 Blu-RayRecorder.org.uk. All Rights Reserved.